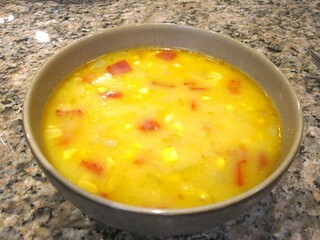 This is a salty yet sweet, creamy yet crunchy fresh corn chowder. It’s loaded with fresh corn (6 ears worth) and dotted with jalapeño and red bell pepper. The taste of the finished soup is pure summer. Husk corn. Dice onion and mince garlic. Cut jalapeño in half lengthwise, discard seeds and mince. Cut bell pepper in half lengthwise, discards seeds and dice. Chiffonade basil leaves. For the corn stock, cut kernels off corn ears and reserves cobs. In large pot, combine cobs, pepper 1 pinch salt and 8 cups water. Bring to a boil, then reduce heat to medium and simmer for 30 minutes. In another soup pot over medium-low heat and add oil. Add onion, jalapeño and red pepper. Stir vegetables until onions are translucent and peppers are soft but not brown, 5 to 10 minutes. Add garlic and stir 1 and 1/2 minutes more, until garlic is golden but not brown. Increase heat to medium, and add butter and corn kernels. Add a teaspoon of salt, pepper to taste and stir for about 4 minutes. Adds more salt and pepper to taste. Add 3 cups corn stock. Stir broth. Add light cream or milk and stir. Cover pot and lower heat to simmer for 10 minutes.